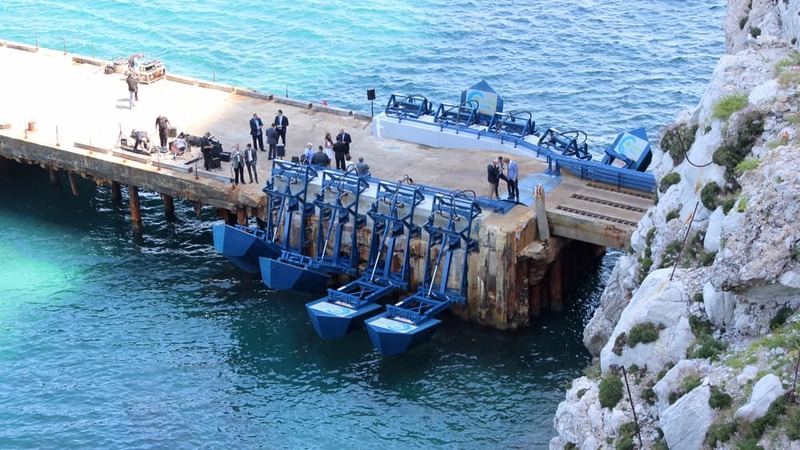 Last month, the first ever grid-connected wave power station in Europe was opened for business in Gibraltar, tiny British territory. Eco Wave Power (EWP) developed innovative wave energy station, which is installed on the ammunition jetty and will be producing 15 percent of the territory's energy needs. The technology, which captures energy by harnessing the rise and fall of the waves, was first tested back in 2012, in a tank at Ukraine's Institute for Hydromechanics in Kyiv. The motion is converted into fluid pressure, which then spins a generator to produce electricity. The power station is currently capable of producing 100 KW, but the team expects to increase the amount of energy being generated by the first phase of the next plant to be built in Mexico up to a 4.1 MW. After completion of Mexican project, power station will have an installed capacity of 25 MW. Despite increased costs because of use of fixed coastal pylons, project still will be cost-effective. EWP quoted World Energy Council figures, stating that the market potential for wave energy currently stands at a mind-blowing one trillion US dollars.